A friend of mine recently voiced frustration over the fact that gardening seemed near impossible in her apartment. It can definitely be frustrating to have the passion and drive for gardening but not have a good space for it. Let’s face it, a tiny herb garden in your kitchen window will only go so far. If I’m growing herbs, I want to grow enough basil to make a year’s supply of pesto. When you don’t have a plot of land for a garden, stackable planters from Mr. Stacky are an incredible solution. These planters take up just two square feet of space and are great for growing a variety of fruits, vegetables, flowers, and herbs. In this video, we demonstrate how to easily plant our Seed Pacs in your Mr. Stacky planters. For extra credit, place your planters on a lazy susan for ultimate access. Take a moment and Google “pallet garden” and be amazed at the gardens people create with old, wood pallets. Joe Lamp’l of Growing A Greener World gives this great step-by-step guide on how to build your own pallet garden and grow a great variety of crops. This garden can be mounted to a wall or feet can be added to make it a freestanding structure. If you’re looking to show off your artistic flair, this is the way to go. 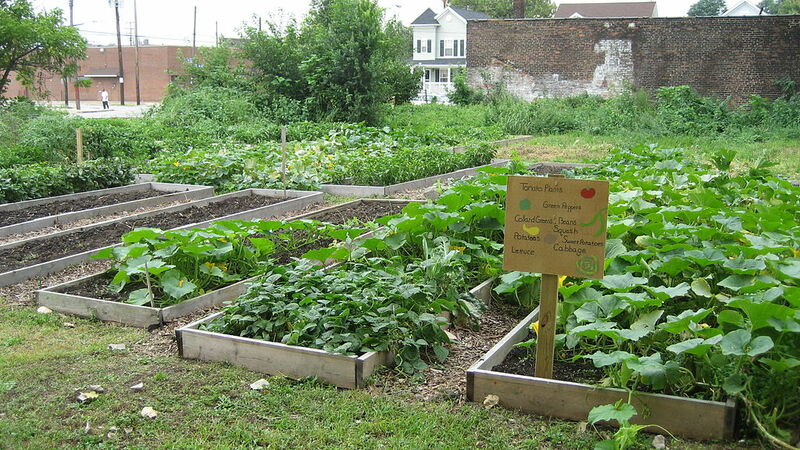 If you really have no space whatsoever, a community garden is a great idea. I just searched for community gardens near me and found that I can rent a 200 square foot plot of land for $60 per year and a 400 foot plot for $100. This is an amazing price and actually includes tools and water. Chances are that you have a community garden near you. The American Community Gardening Association is a great resource and can help you locate one. The last resource for those of us that don’t have a lot of space is Mel Bartholomew’s Square Foot Gardening method. Mel lays out everything you need to build a space-save garden box, to fill it with the right soil, and know how much of each crop you can grow per square. While the standard square foot garden is four feet by four feet, you can easily adapt it to fit your available space. These can be built on a variety of surfaces like a cement driveway or wood deck. These are just some of the many ways to successfully garden without a whole lot of space. Which of these is your preferred method for gardening in a tight space?